TOFU MOM . . . and gravy! : Happy New Years! I'm doing things in typical backwards order and posting New Years first, then I'll wander back here some time (in February most likely, ha!) and add the pictures and recipes from Christmas. Besides the tradition part, black eyed peas have a lot of other things going for them. If you like them, don't limit yourself to once a year! They are wonderfully smoky, "earthy" and sooo delicious (as well as being an excellent source of fiber, calcium and IRON, ladies). Here's the recipe I usually use, called "Hoppin' John". It's a great pot of stewed black-eyed peas and veggies. Yum. I freely admit I stole the basic idea from Emeril and the fine folks at Food Network. (Hey, you'd be surprised how much fun it is to mentally "vegan-ize" everything he cooks! )Traditionally (since we're being traditional and all!) it has a big ol' HAM BONE sitting in the pot, but being that I'd rather not have animal bones staring at me while I eat and the pig would rather keep his bones INSIDE his fat self... well, I substitute that flavor with some "Liquid Smoke" which is basically an all-vegan smoke concentrate flavoring. If you need the meaty bits, add seitan or whatever suits your fancy. Do plan ahead though. 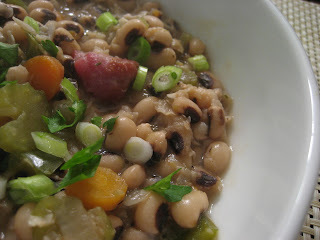 Black-eyed peas from a can are not nearly as good as those you soak and cook yourself. Heat oil in a large soup pot. Add the onion, celery, carrot, red pepper, and garlic, cook for 4 minutes. Add the black-eyed peas, stock, bay leaves, thyme, liquid smoke and seasonings. Bring to a boil, reduce the heat and simmer for 40 - 60 minutes, or until the peas are creamy and tender, stir occasionally. If the liquid evaporates, add more water or stock. Adjust seasonings, and garnish with green onions and chopped fresh parsley. Serve over rice. Happy Ham-Free New Years everyone! Thanks for the comment! It made my day. I've visited quite a few times, your recipes look delicious. (I can see why they're so famous). yr black eyed peas look lovely. i love me some black eyed peas! I grew up vegetarian in the 80s when tofu was something we had heard of, but never tried before. No tofu let alone tempeh, seitan, and fake meats from the freezer section. We had beans almost every day. I hope you had a great Christmas and will have a happy new year. Black eyed peas are great. We too keep with tradition and eat those little bits of goodness on New Years Day. We also eat them throughout the year. DH and I faithfully watch food network and enjoy veganizing the recipes too. Even though DH is an omni he yells out "you can vegan that honey" all during the shows. He is so cute. I've never tried black eyed peas. The recipe counds delicious.